Dental implants can be a solution to replace missing teeth. 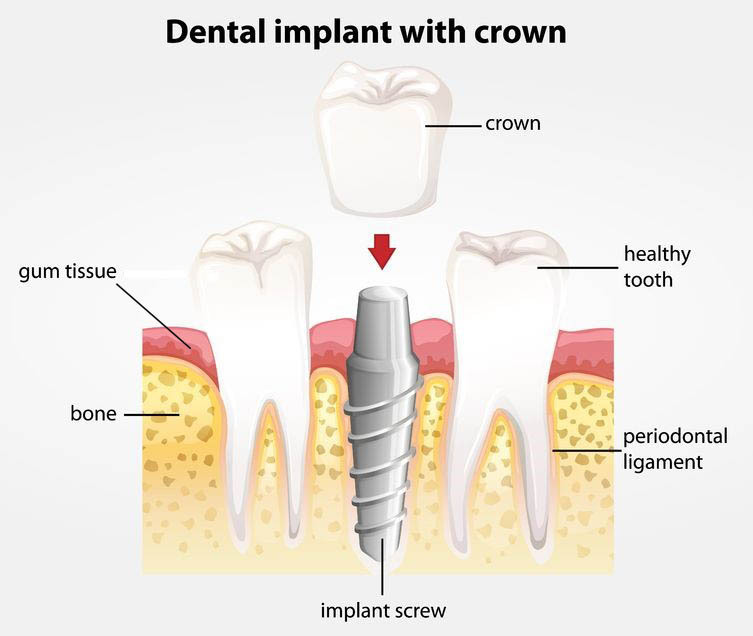 A dental implant is a specially designed titanium screw that is surgically placed into your jaw bone where the tooth is missing. It replaces the root of the missing tooth, which will support a new prosthesis such as crown, bridge or denture. There are many reasons why dental implants are better than bridges or dentures. An implant tooth replacement look and function like a natural tooth. It resides in the jaw bone and is fixed. It is hence more stable and comfortable than a bridge and denture. Unlike a bridge, the neighboring teeth need not be trimmed and hence preserved. It is easier to clean and maintain an implant compared to a bridge or denture. It can last for many years if properly maintained. So, you can eat and smile more confidently with an implant. How is an implant done? Initial AssessmentYour dentist will do an assessment to see if you are suitable for implant treatment. This may involve taking of radiographs and impressions. In situations where there are insufficient bone, your dentist may advise you on bone augmentation treatment. The surgery will be performed under local anaesthesia. The gum and soft tissue will be pushed aside to expose the jaw bone. Your dentist will prepare the jaw bone for the implant screw. Once the implant is inserted, the gum and soft tissue will be stitched back. Sometimes a replacement cap or temporary denture may be made and placed over the implant. The implant is usually allowed to heal and integrate with the jaw bone for 3-6 months. Your dentist will decide if the implant is fully integrated and stable before the prosthesis such as crown, bridge or denture can be made. Your dentist will make impressions to be sent to the laboratory for the fabrication of the prosthesis. The final stage involves the placement of the prosthesis over the implant screw. A review visit will allow your dentist to assess if the prosthesis is functioning well, check the implant response to the new prosthesis placement, and adequacy of dental home care. Medisave can be used to pay for part of the cost for implant treatment. Please check with the staff for further details.